The brethren of Bootle Pilgrim Lodge No 1473 were pleased to have Past Deputy Provincial Grand Master Howard Jones as the principal guest to their annual installation ceremony at Litherland Masonic Hall. The lodge was first opened in due form by the installing master Michael Melia. 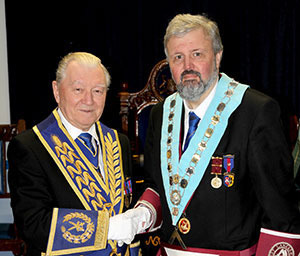 Howard Jones (left) congratulating Russell Skidmore on becoming WM. On completing the opening and the lodge business, Howard was admitted accompanied by Ormskirk and Bootle Group Chairman Graham Chambers, vice chairman Malcolm Alexander and a number of grand officers and Provincial grand officers. Michael Melia thanked the visitors for their attendance and warmly welcomed Howard Jones to the evening’s ceremony. He then thanked the officers of the lodge for their support during his term of office as master and said he knew the same support would be offered to the incoming master, Russell Skidmore. Michael then requested Gordon Martin to honour the lodge by occupying the senior warden’s chair, Ken Mitchell the junior warden’s chair and Howard Dinsdale to take the inner guard’s position. On the commencement of the installation ceremony, master elect Russell was presented by Ron Elliott before being installed in the chair of King Solomon in fine style. The working tools of each degree were presented in an exemplary manner, with those of a master Mason given by Keith Rushton, the fellow craft’s and entered apprentice’s by George McDonald. After the officers for the forthcoming year were installed, the address to the master was delivered in superb style by Ron Elliott, the address to the wardens by Gordon Martin and the address to the brethren of the lodge by Howard Jones. Russell’s first duty as master was a pleasant one, as he presented cheques to Howard on behalf of the lodge. The first one was to the MCF 2021 Festival for £400, the second to Masonic Blood Bike’s for £100, a further £100 to The Friends of the Hall (FROTH) and finally £100 to Friends of the Tithebarn, a grand total of £700. The lodge throughout the evening set a sterling example of how an installation ceremony could be shared amongst the members and make them all feel involved. After closing the lodge, the brethren moved into the dining room to toast the health of the new master, before enjoying the festive board. As was to be expected, it was a lively and convivial affair. Pictured from left to right, are: Graham Chambers, Ian Gee, Howard Jones, Russell Skidmore, Mike Melia, Ron Elliott and Malcolm Alexander.